I am looking to share my kites with others. It seems a lot of us could benefit from trying the different kites we talk about. I have heard a lot about the Talon and Sea Devils, Prism 4's. Truth is I have no real concept of any of these kites. Or if any of them fly any better or worse than I have. I do not consider myself an accomplished flyer by any means. This season my goals will be to improve as much as I did last season. I will fly a fade for over 5 minutes this summer is my (#1.) Objective. Some of the Wednesday Night guys might want to try the different kites also. I'll find out from Devin if he has a couple of kites to share also. Having Jon fly them will also be a +plus . He can also fix anything I break (hehehehe). Or anything that happens to my kites he can fix. NOt a problem. Shipping can't be that much. I suppose some rules Honsety is Best. Little groups of maybe five guys. It could be by geographical location. Some Feed Back On This Would Be Great ... Then Norm's tricks will face the best we have to offer. I've got maybe 50 kites but I doubt anyone would want to fly them. Old skool. it is always good to see sharing of ideas and kites out there!!!! I feel that is what will really help the kite community and industry more than anything else. The library on 'the other place' works very well. Basically you borrow the kite for a month ( unless no-one else asks for it in which case you hold onto it) then pass it on to the next person on the waiting list. 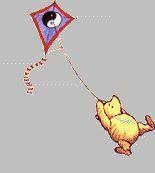 There is no charge for loaning the kite, but you pay postage to pass it on to the next person who in turn pays to pass it to the next etc etc. You have to be a registered user on the site and provide valid email address and real name and address so that the kite can tracked from person to person. Norm, I guess you do have a good point. We used to do some kite sharing on the ClassyKite forum, it was called the Swap Club. But the first rule of the Swap Club is that no one talks about the Swap Club. It was for the inner core of forum participants, and an admin would have to approve you. I also have gotten demos from certain kite makers, but every one I liked so much, I offered to buy. I never did think too much about possibly damaging the loaner kite, I just flew extra careful, just like if the person who's loaning the kite is standing right next to you. I tried Sammy's Vendetta a couple years ago when we met up, I just flew carefully and didn't try anything stupid. I would do whatever it took to repair a kite if I wrecked it, and I guess that would have to be the agreement between the loaner and loanee for Joe's idea to work without hard feelings in the event of an accident. It would have to be between loaner and borrower. The loaner would approve the borrower through experience, reputation or referral. The borrower would pay postage to and from. A small price to pay to try out an expensive kite. Norm has a good point, but I think it depends on the kite as well. With a $400+ kite like a custom Sky Sport Design or Alphakite I don't think I would be willing to lend it out, unless it was someone I considered an expert flier. I personally am very reluctant to borrow someone else's kites. I would take extra special care of it and I have no problem fixing it if I broke it, but things like Norm mentioned are exactly why I'm afraid. I also know how hard I am on the noses of my kites from all of the pounding. That being said I still think it's a good idea, but it's just up to the relevant parties to decide if they agree to it. BTW Allen, don't think I wouldn't be interested in an old school kite. After all of the talk about Hawaiian team kites, I would love to just have fun flying one without maybe buying one. If I liked it that much I might buy one of the replicas. There might be other kites I discovered I liked too. To be fair, the kites in the FA library are kites that have been donated to the library rather than peoples actual kites. Sometimes these are older well used but still servicable kites or kites people have moved up from. I have to admit that while I don't mind letting people have a go with a kite, I would be reluctant to send a really good kite of my own to someone I didn't know well. Either way the borrower would have to be responsible for any repairs or, in the worst case, replacement if damage was done. After all of the talk about Hawaiian team kites, I would love to just have fun flying one without maybe buying one. If I liked it that much I might buy one of the replicas. There might be other kites I discovered I liked too. Love my Hawaiian even more after it went on a sky shark diet to eliminate the heavy fiberglass frame. I love old skool too. but my collection is much smaller. I see the value in having some type of program as well. I agree. Love the old school stuff. I just got two EFM's, and two more MEFM's. Heh.... yup, you will often find clumps of crude oil (more like tar) on the Central Coast beaches in California. It's a little weird. I'm 'old skool' and a number of my kites have frames dating from the PC (pre-carbon) Era. still have my kites with frames dating from the PC (pre-carbon) Era. Reminds me of when I have a full head of hair.